As the third most common medical condition in the US, it’s no surprise that there is an abundance of information and research on hearing loss. Sorting through all of this information may overwhelm you, especially when you’re just beginning your journey to better hearing health. We have compiled 10 important questions for you to ask your audiologist as you get ready to seek treatment for your hearing loss. From your audiogram (results from your hearing test), we will be able to determine what type of hearing loss you have. There are three types: conductive, sensorineural, and mixed. Conductive involves the outer and middle ear, while sensorineural affects the inner ear, hair cells, and neural passages. Mixed hearing loss is a combination of both. 2. Does diet or medication play a role in my hearing loss? If you are on medication, remember to mention this to us before your hearing exam. There are certain medications that have been linked to inner ear hair cell damage, which leads to hearing loss. Studies have found that people with hearing loss have lower B12 and folic acid levels than people normal hearing. The more details you have about your lifestyle, the better your audiologist can serve you. 3. Will a hearing instrument help me? 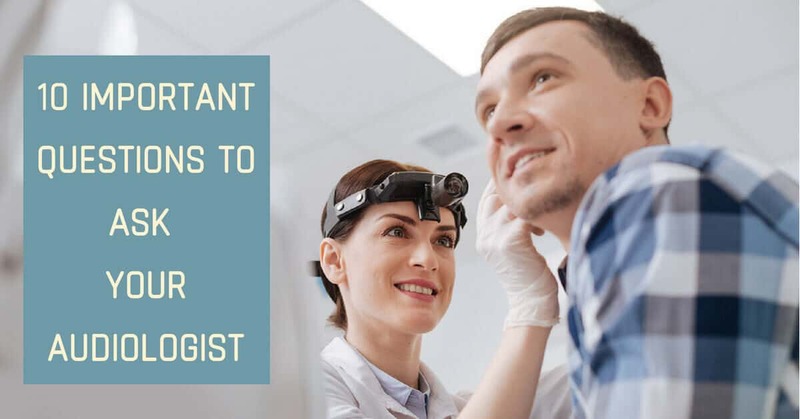 Dr. Roselynn Gamboa Young, our audiologist, will determine whether or not a hearing instrument will help you, based on the degree and type of hearing loss you experience. Generally speaking, there are hearing instruments that treat varying degrees of hearing loss, from mild to profound. 4. Will a hearing aid worsen my hearing? No, they will not. Hearing aids are intricate and precise instruments designed to enhance the sounds you want to hear. In fact, many studies have shown that wearing a hearing aid helps you hear better and preserve the auditory channels your brain has in place. Your audiologist will work with you to customize the best treatment. 5. Does a hearing aid work in background noise? Yes. Most hearing aids have different sets of microphones, to give the wearer a better sense of their surroundings with spatial sound. In some cases, if background noise becomes overwhelming, there is an option to turn off the back microphones. Digital hearings reduce background noise and enable the wearer to focus in on the sounds they want to hear. Your audiologist will provide you with a range of options. 6. What can I do to protect my hearing? Your audiologist will give you information on preventing exposure on damaging noise levels as well as practices to incorporate into your daily life, such as the 60-60 rule: listen to music or media for only 60 minutes at a time at 60% volume. Custom-made hearing protection, such as earplugs, is also a great option if you work in loud environments. 7. Will I need to make many lifestyle changes with a hearing aid? Depending on your hearing aid, your audiologist will give you detailed instructions on when to wear them and when to take them out. Most hearing aids are sensitive to water, so you will have to remove them before a shower or swimming. Wearing a hearing aid may at first feel like a strange experience, after not hearing as clearly for some time. Your audiologist will give you advice on daily activities with your new hearing aid. 8. Do I need to wear two hearing aids? Again, this answer depends on the type and degree of your hearing aid. Your audiogram indicates hearing levels by ear, which will inform your audiologist on the best treatments for you. If you do have binaural hearing loss (hearing loss that affects both sides), then using two hearing aids is the best option. 9. Are hearing aids covered by Medicare? At this time, Medicare does not cover hearing aids. There are legislative actions in the works to have Medicare cover hearing aids and hearing loss-related expenses. 10. What kind of maintenance do I need to keep up with my hearing aid? Our team at Roseville Diagnostic Hearing Center will give you detailed instructions on care for your hearing aid. It is recommended to remove hearing aids at night and keep them in a cool, dry place. Ask us about rechargeable battery options, as an average hearing aid requires a weekly or biweekly battery change. Our team will also recommend schedule for you to come in to have your hearing aids cleaned and tuned up. To get on the path to better hearing, contact us at Roseville Diagnostic Hearing Center today.